Haha! Thanks. It’s the truth, maybe exaggerated for story telling purposes but those poor folks at the comic book store. Very funny Predator craving :)! I hope you will have easier pregnancy days from now on. Holy mama! Definitely conversation starters. Ha! I think my honey is a bit perplexed by all the Predator comic books on our coffee table. I think it comes down to a genre preference. Aliens is more horror IMO, while Predator is more action. Aliens is pretty action-y, though. I like that and Alien pretty much equally, though. It is, but maybe it just terrified me too much? That idea of “in space no one can hear you scream” is just soooo frightening to me. There’s no escape!! Feel better, Predator comics will revive you! I had no idea those existed by the way. It would be a bit strange if you were into the Predator…that…way…however I’m reading some jacked up fairy tales at the moment including Angela Carter’s version of Beauty and The Beast in which “beauty” is attracted to a tiger. So there. I already feel better- it was just a weird day I think. But thank you. Predator healed me!! 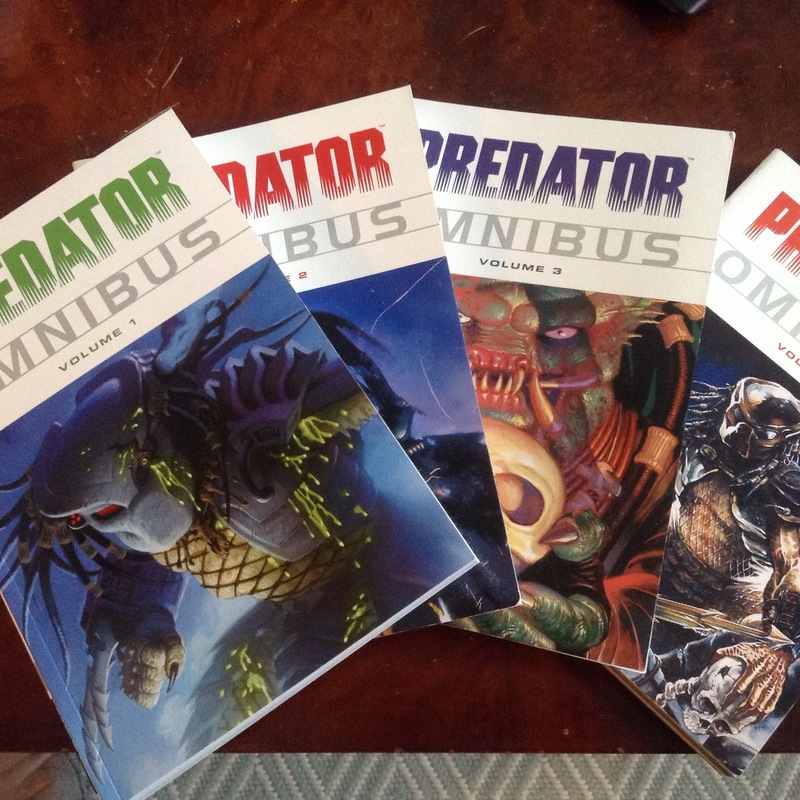 Predator comics have healing properties, I will spread the word. The cover art is kind of cool too! Hooray! Comic book haul! What’s your favorite of all your comics? I haven’t read many either just The Walking Dead, some Buffy and some weird Simpson’s comics I read when I was little and the free Spiderman comic books that use to be in the Sunday paper as in insert. I guess I really need to explore more. Last night a friend told me she has the Comixology app, if I spelled that right, that lets you buy or read comics & it sounded like the color & graphics looked really good. Someone else recommended that to me too! I’m going to look it up. You are too much!!! Happy reading and I hope you’re feeling better. We all have ’em… well, sort of! Oh, wanted to ask: Do you ever read your comics from say a tablet? If so, there’s a very cool comic app called, COMIX. You know, for days when going outside just ain’t gonna happen! I haven’t! I just discovered the SFPL let’s you check things out on your tablets, so I just started reading things that way. I’ll check out the app. Do you have any recommendations on what to read? Boy, do I! Do you know ‘Red Sonja? There are two ‘omnibus’ versions I know of which are collected editions. Great art, great reading. ‘Artesia’, another great series featuring a warrior woman heroine, Stephen King’s ‘The Dark Tower’ in comic form is insanely good, I’m an X-Men fan so the ‘Ultimate X-Men series is one I highly recommend. I’ll stop there ’cause I’ve got lots more! Oh I love X-Men! I’ll get that one. I am so new to reading comics but I prefer omnibuses. Love being able to read everything with out breaks in between. I’m taking your recs to the store. I know of plenty more if you’re ever in need of more recs! You are awesome. Thank you!! Right back at cha, kid! This is how I felt when I discovered the Angel: After the Fall series. Wow! I wish that movie was in the works instead of the stupid Batman v. Superman. I’m actually looking forward to Bats vs Supes personally, but there is an awesome short movie made by some of the stunt team from Batman begins, called Batman: Dead End, that has Bats face off against Predator and Aliens. It is amazing and worth a watch. You can find the full short on You Tube. The costumes for the Predators are original ones from the first two movies. Thanks for the tip!! I can’t wait to check it out. Margaret! Been in and out of blogging with all the stuff going on this side of the Atlantic. Such great news! So happy for you! And congratulations for the Art Fair! Very much deserved.